If you don’t have a domain name already, you’ll need to choose and register one. You can purchase a domain name from a number of popular registrar sites. Our domain partner have good pricing and a simple domain name management. Registrars will charge you an annual service fee to maintain your domain, but VBOUT itself does not charge you extra for this feature. If you already own a domain name, or you just registered one, you’ll need to update the DNS settings for this domain in order to tell your registrar that this domain (or subdomain) points to VBOUT from now on. 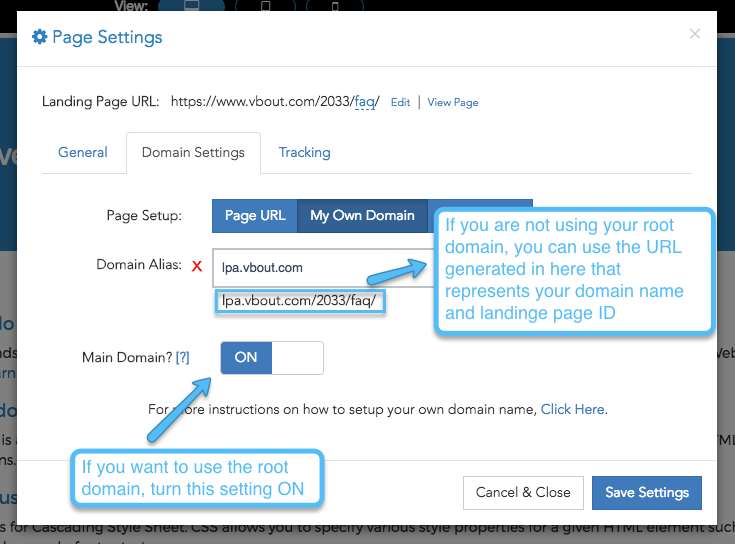 On your registrar’s DNS settings page, create a CNAME record and make it point to “landing.vbout.com”. All registrars should have documentation on how to do this (Our support can always assist you in getting this configuration setup properly). Once you do that, you can go back to your VBOUT dashboard and head over to the landing page in question and click on edit to enter into editor mode. 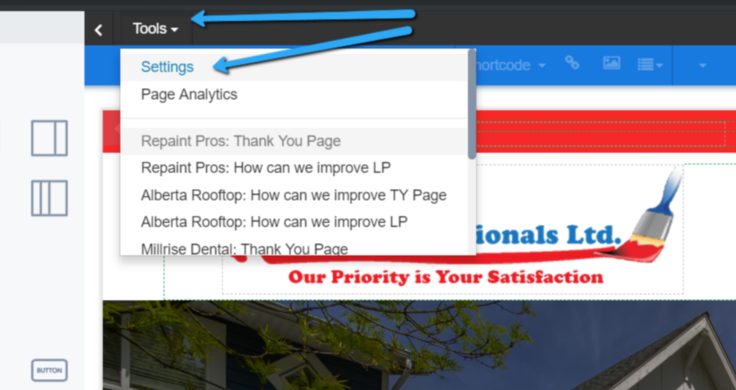 From the top Toolbar, click on Settings, a popup window will appear, then select Domain Settings from the top tabs, and finally click on My Own Domain. Inside the Domain Alias drop select field, click on Add new domain… or select your domain if it has already been added before. If this domain will be used as it is solely for this landing page, you will need to turn the Main Domain? setting On. 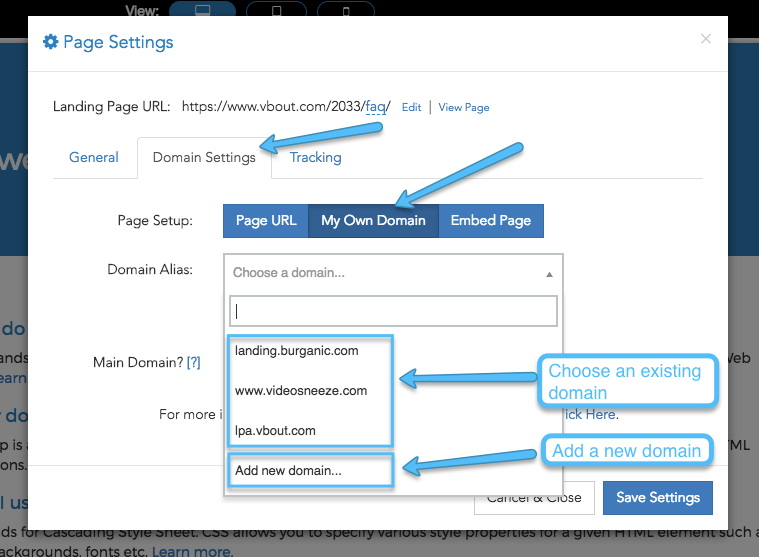 Else once you complete step 4, you will be able to use your custom domain (or subdomain) to point to your created landing page using this format: domain.com/page/[PAGE-ID] where page ID is the unique identifier of the page as provided by Vbout.com. Note: When using your root domain, you might want to add one more record to your DNS settings on the registrar side. In general, you will have to add two records one for www.domain.com, and the other for *.domain.com and make each one of them point to landing.vbout.com. For Godaddy users, you won’t be able to point your wildcard domain (*.domain.com) to an external site. For that, we recommend you add a domain forwarding rule from domain.com to www.domain.com. For more details on setting up a CNAME on your DNS, read this article.